Quercus brachycarpa Guss. ex Parl. Quercus robur (Ten.) A. DC. Quercus robur is a large deciduous tree, with circumference of grand oaks from 4 m (13 ft) to exceptional 12 m (39 ft). The Majesty Oak with a circumference of 12.2 m (40 ft) is the thickest tree in Great Britain, and the Kaive Oak in Latvia with a circumference of 10.2 m (33 ft) is the thickest tree in Northern Europe. Quercus robur has lobed and nearly sessile (very short-stalked) leaves 7–14 cm (2.8–5.5 in) long. Flowering takes place in mid spring, and the fruit, called acorns, ripen by mid autumn. The acorns are 2–2.5 cm (0.79–0.98 in) long, pedunculate (having a peduncle or acorn-stalk, 3–7 cm (1.2–2.8 in) long) with one to four acorns on each peduncle. Quercus robur is very tolerant to soil conditions and the continental climate but it prefers fertile and well-watered soils. Mature trees tolerate flooding. 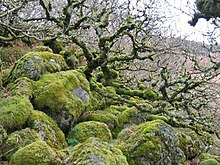 It is a long-lived tree, with a large wide spreading crown of rugged branches. While it may naturally live to an age of a few centuries, many of the oldest trees are pollarded or coppiced, both pruning techniques that extend the tree's potential lifespan, if not its health. Two individuals of notable longevity are the Stelmužė Oak in Lithuania and the Granit Oak in Bulgaria, which are believed to be more than 1500 years old, possibly making them the oldest oaks in Europe; another specimen, called the 'Kongeegen' ('Kings Oak'), estimated to be about 1200 years old, grows in Jaegerspris, Denmark. Yet another can be found in Kvilleken, Sweden, that is over 1000 years old and 14 metres (46 ft) around. Of maiden (not pollarded) specimens, one of the oldest is the great oak of Ivenack, Germany. Tree-ring research of this tree and other oaks nearby gives an estimated age of 700 to 800 years. Also the Bowthorpe Oak in Lincolnshire, England is estimated to be 1000 years old, making it the oldest in the UK, although there is Knightwood Oak in the New Forest that is also said to be as old. The highest density of Q. robur with a circumference of 4 metres (13 ft) and more is in Latvia. Within its native range Q. robur is valued for its importance to insects and other wildlife. Numerous insects live on the leaves, buds, and in the acorns. Q. robur supports the highest biodiversity of insect herbivores of any British plant (>400 spp). The acorns form a valuable food resource for several small mammals and some birds, notably Eurasian jays Garrulus glandarius. Jays were overwhelmingly the primary propagators of oaks before humans began planting them commercially (and still remain the principal propagators for wild oaks), because of their habit of taking acorns from the umbra of its parent tree and burying them undamaged elsewhere. Mammals, notably squirrels who tend to hoard acorns and other nuts usually leave them too abused to grow in the action of moving or storing them. Quercus robur is planted for forestry, and produces a long-lasting and durable heartwood, much in demand for interior and furniture work. The wood of Q. robur is identified by a close examination of a cross-section perpendicular to fibres. The wood is characterised by its distinct (often wide) dark and light brown growth rings. The earlywood displays a vast number of large vessels (~0.5 mm (0.020 in) diameter). There are rays of thin (~0.1 mm (0.0039 in)) yellow or light brown lines running across the growth rings. The timber is around 720 kg (1,590 lb) per cubic meter in density. A number of cultivars are grown in gardens and parks and in arboreta and botanical gardens. The most common cultivar is Quercus robur 'Fastigiata', and is the exception among Q. robur cultivars that are generally smaller than the standard tree, growing to between 10–15 m and exhibit unusual leaf or crown shape characteristics. English oak is one of the most common park trees in south-eastern Australia, noted for its vigorous, luxuriant growth. In Australia, it grows very quickly to a tree of 20 m (66 ft) tall by up to 20 m (66 ft) broad, with a low-branching canopy. Its trunk and secondary branches are very thick and solid and covered with deep-fissured blackish-grey bark. The largest example in Australia is in Donnybrook, Western Australia. Quercus robur 'Fastigiata' ("cypress oak"), probably the most common cultivated form, it grows to a large imposing tree with a narrow columnar habit. The fastigiate oak was originally propagated from an upright tree that was found in central Europe. Quercus robur 'Concordia' ("golden oak"), a small very slow-growing tree, eventually reaching 10 m (33 ft), with bright golden-yellow leaves throughout spring and summer. It was originally raised in Van Geert's nursery at Ghent in 1843. Quercus robur 'Pendula' ("weeping oak"), a small to medium-sized tree with pendulous branches, reaching up to 15 m.
Quercus robur 'Purpurea' is another cultivar growing to 10 m (33 ft), but with purple coloured leaves. Quercus robur 'Filicifolia' ("cut-leaved oak") is a cultivar where the leaf is pinnately divided into fine forward pointing segments. Along with the naturally occurring Q. 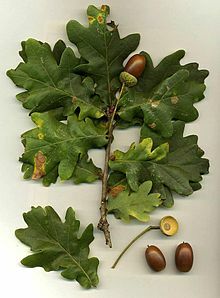 × rosacea, several hybrids with other white oak species have also been produced in cultivation, including Turner's Oak Q. × turnerii, Heritage Oak Q. × macdanielli, and Two Worlds Oak Q. × bimundorum, the latter two developed by nurseries in the United States. Q. × rosacea Bechst. (Q. petraea x Q. robur), a hybrid of the sessile oak and English oak. It is usually of intermediate character between its parents, however it does occasionally exhibit more pronounced characteristics of one or the other parent. Q. × turnerii Willd. (Q. ilex × Q. robur) (Turner's oak), a semi-evergreen tree of small to medium size with a rounded crown; it was originally raised at the Holloway Down Nursery of Spencer Turner, Leyton, Essex, UK, noted by the zoologist Jean-Baptiste Lamarck at Trianon, Versailles in 1783, as the chêne de turnère. (Turner had died in January 1776, and the nursery grounds, on extended lease, returned to the landowner.) An early specimen is at the Royal Botanic Gardens, Kew. Q. × warei (Q. robur fastigiata x Q. bicolor), a hybrid between upright English oak and the swamp white oak. The selections within this hybrid include 'Long' (Regal Prince) and 'Nadler' (Kindred Spirit). In the Basque Country (Spain and France) the oak symbolises the traditional basque liberties. This is based on the 'tree of Gernika', an ancient oak tree located in Gernika, below which since at least the 13th century the Lords of Biscay first, and afterwards their successors the Kings of Castile and the Kings of Spain solemnly swore to uphold the charter of Biscay, which secured widespread rights to the inhabitants of Biscay. Since the 14th century, the Juntas Generales (the parliament of Biscay) gathers in a building next to the oak tree, and symbolically passes its laws under the tree as well. Nowadays, the Lehendakari (Basque prime minister) swears his oath of office under the tree. The national coat of arms of Bulgaria includes two crossed oak branches with fruits - as shield (escutcheon) compartment. Oak leaves with acorns are depicted on the reverse of the Croatian 5 lipa coin, minted since 1993. The pedunculate oak of the Croatian region of Slavonia (considered a separate subspecies - Slavonian oak) is a regional symbol of Slavonia and a national symbol of Croatia. The oak tree has had a symbolic value since Ancient times. Some oaks were considered sacred trees by the Gauls. The druids would cut down the mistletoe growing on them. Even after Christianization, oak trees were considered to protect as lightning would fall on them rather than on nearby inhabitation. Such struck trees would often be turned into places of worship, like the Chêne chapelle. King Saint Louis has been represented rendering justice under an oak tree. During the French Revolution, oaks were often planted as trees of Freedom (fr). One of such trees, an oak planted during the 1848 Revolution, survived the destruction of Oradour-sur-Glane by the Nazis. The branch of oak is part of the National emblem of France. After the announcement of General Charles de Gaulle's death, caricaturist Jacques Faizant represented him as a fallen oak. In Germany, the oak tree is used as a typical object and symbol in romanticism. It can be found in several paintings of Caspar David Friedrich and in "Of the life of a Good-For-Nothing" written by Joseph Freiherr von Eichendorff as a symbol of the state protecting every man. In those works the oak is shown in different situations, with leaves and flowers or dead without any of its previous beauty. Those conditions are mostly symbols for the conditions Germany is in or going through. Furthermore, the oak's stem is a symbol for Germany's strength and stability. Oak branches were displayed on the reverse of coins of the old Deutsche Mark currency (1 through 10 Pfennigs; the 50 Pfennigs coin showed a woman planting an oak seedling), and are now also displayed on the reverse of German-issue Euro currency coins (1 through 5 cents). The Romanian Rugby Union side is known as The Oaks. In England, the English oak has assumed the status of a national emblem. This has its origins in the oak tree at Boscobel House, where the future King Charles II hid from his Parliamentarian pursuers in 1650 during the English Civil War; the tree has since been known as the Royal Oak. This event was celebrated nationally on 29 May as Oak Apple Day, which is continued to this day in some communities. ‘The Royal Oak’ is the third most popular pub name in Britain (541 in 2007) and has been the name of eight major Royal Navy warships. The naval associations are strengthened by the fact that oak was the main construction material for sailing warships. The Royal Navy was often described as ‘The Wooden Walls of Old England’ (a paraphrase of the Delphic Oracle) and the Navy’s official quick march is "Heart of Oak". In folklore, the Major Oak is where Robin Hood is purportedly to have taken shelter. Furthermore, the oak is the most common woodland tree in England. An oak tree has been depicted on the reverse of the pound coin (the 1987 and 1992 issues) and a sprig of oak leaves and acorns is the emblem of the National Trust. Grandinin/roburin E, castalagin/vescalagin, gallic acid, monogalloyl glucose (glucogallin) and valoneic acid dilactone, monogalloyl glucose, digalloyl glucose, trigalloyl glucose, rhamnose, quercitrin and ellagic acid are phenolic compounds found in Q. robur. The heartwood contains triterpene saponins. ^ Nixon, Kevin C. (1997). "Quercus robur". In Flora of North America Editorial Committee (ed.). Flora of North America North of Mexico (FNA). 3. New York and Oxford – via eFloras.org, Missouri Botanical Garden, St. Louis, MO & Harvard University Herbaria, Cambridge, MA. ^ Huang, Chengjiu; Zhang, Yongtian; Bartholomew, Bruce. "Quercus robur". Flora of China. 4 – via eFloras.org, Missouri Botanical Garden, St. Louis, MO & Harvard University Herbaria, Cambridge, MA. ^ "Kong Frederik den Syvendes Stiftelse paa Jægerspris". www.kongfrederik.dk. Retrieved 23 October 2017. ^ Moström, Jerker (May 2006). "The Oak Tree, from Peasant Torment to a Unifying Concept of Landscape Management" (PDF). The Oak – History, Ecology Management and Planning. Linköping, Sweden: National Heritage Board of Sweden. ^ White, John (1995). Forest and Woodland Trees in Britain. Oxford University Press. p. 131. ISBN 0-19-854883-4. ^ British Oak. Niche Timbers. Accessed 19-08-2009. ^ "Quercus robur". Metrotrees.com.au. Retrieved 2 May 2012. ^ Nina Smith (10 December 2009). "Australia's Biggest Oak Tree". Donnybrookmail.com.au. Retrieved 2 May 2012. ^ Henry John Elwes, The Trees of Great Britain and Ireland, s.v. "Quercus", p. 1189. ^ "Kew: Plants: Turner's Oak, Quercus x turneri". Rbgkew.org.uk. 16 October 1987. Archived from the original on 20 August 2008. Retrieved 2 May 2012. ^ "Plant of the Month". Buckeyegardening.com. Retrieved 2 May 2012. ^ "''International Oak Society Link''". Oaknames.org. Retrieved 2 May 2012. ^ "Oak mildew". Forestry Commission. 2013. Retrieved 13 April 2013. ^ Croatian National Bank Archived 6 May 2009 at the Wayback Machine. Kuna and Lipa, Coins of Croatia Archived 22 June 2009 at the Wayback Machine: 5 Lipa Coin Archived 4 June 2011 at the Wayback Machine. – Retrieved on 31 March 2009. ^ "Croatian National Symbols". www.kwintessential.co.uk/. Retrieved 23 April 2013. ^ Fifty Trees of Distinction by Prof. D.A. Webb and the Earl of Ross. Booklet, published by Birr Castle Demesne, 2000. ^ "Wiltshire - Moonraking - Oak Apple Day". BBC. 29 May 1931. Retrieved 2 May 2012. ^ "Real Ale and Pub News Features Archive". Solihullcamra.org.uk. 15 November 2007. Archived from the original on 1 March 2012. Retrieved 2 May 2012. ^ "National Maritime Museum". Nmm.ac.uk. Retrieved 2 May 2012. ^ "The Definitive List of British Oak Trees & Their History | EHBP". English Heritage Buildings. 16 February 2018. Retrieved 12 March 2018. ^ Smith, Steve. "The National Inventory of Woodland and Trees - England" (PDF). UK: Forestry Commission. Table 1. p. 52. Wikimedia Commons has media related to Quercus robur in the Czech Republic.